I would recommend arriving to the gardens early in order to escape the larger crowds that descend a little later in the day. Also, beginning October 3rd the gardens will feature Chihuly Nights from 5:30-9pm to allow visitors to view the sculptures during sunset and while illuminated at night. More information can be found on the Denver Botanic Garden’s website. One of the fundamental objectives in design is to create balance, no matter the discipline — landscape design, product design, interior design. There are elements to consider, a check list of sorts to follow. The approach is not set in stone and guidelines exist, yet there’s a need for a creative eye that may be learnt but is more often innate. I’ve asked designers how this works for them and received a variety of answers: color, pattern, lines, context, proportion, functionality. Essentially it comes down to relying on or having a sixth sense or a third eye: you know or see when something is in balance… or not. That’s not to say every element has to be perfect; symmetry can be obtained through a varied palette of color, texture and shape. Using nature for inspiration, I went about looking for clues and found a few images to share. 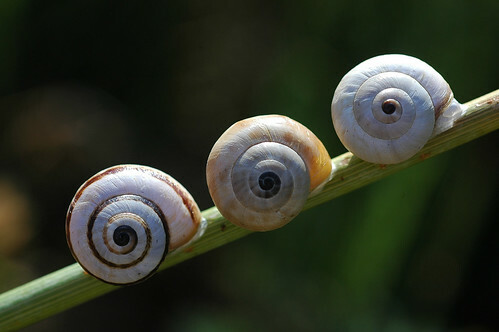 As the snail grows, so does its shell — in a spiral shape, an ever growing circle. Each one of these clusters has four leaves, yet that is where their similarity ends. Amazing. Peacock Feathers have been used for healing for centuries in many cultures. Said to carry Spiritual Healing Energy, they are often used to assist those seeking balance and harmony in their lives. The symmetry of birds as they fly is an inspiring reflection of teamwork at it’s finest! How does your eye see these images?